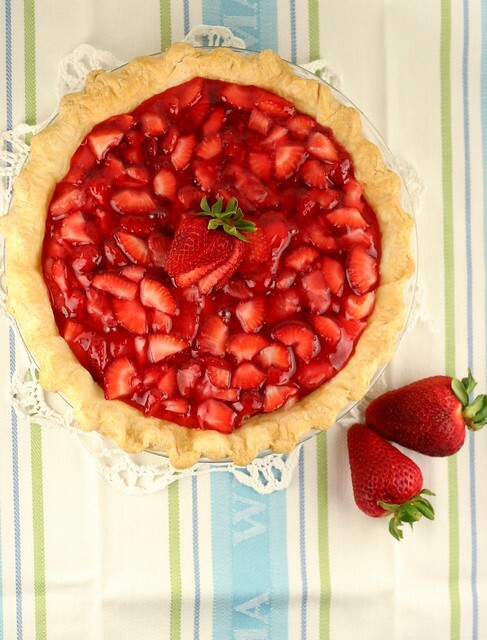 This strawberry pie is kind of beautiful, right? It's the supermodel of pie world. I baked this pie with my Mom about 2 weeks ago. I've been meaning to share it with you ever since, but life has gotten in the way. I didn't really need to tell you that though. I could have just let you believe I made this pie yesterday... but I like to keep it real. We baked a shortbread-type pie crust for this. 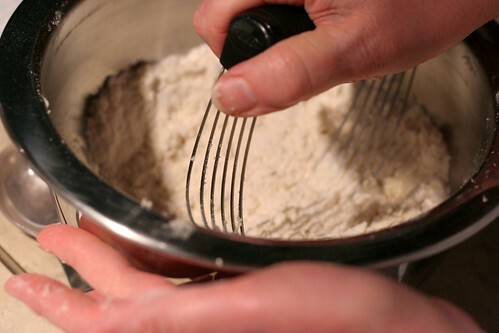 Bake any kind of pie crust you like for super sweet pies... or buy one from the store. I will not judge you at all. 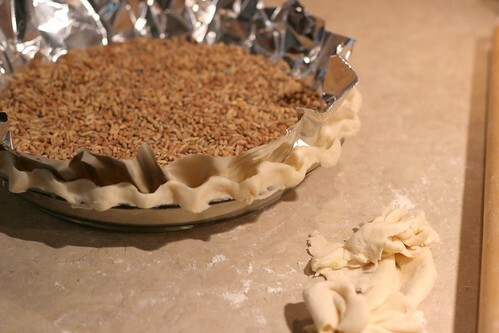 Just a little trick: fill your pie shell with rice or beans to weigh it down while it bakes. 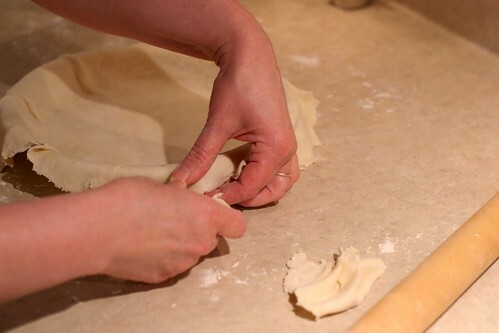 That way, your crust won't bubble up and get air pockets in the oven. 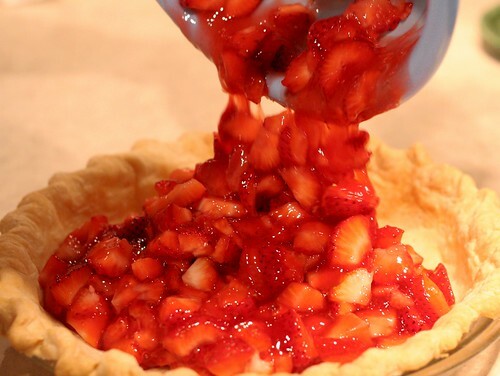 No one likes a bubbly pie crust. 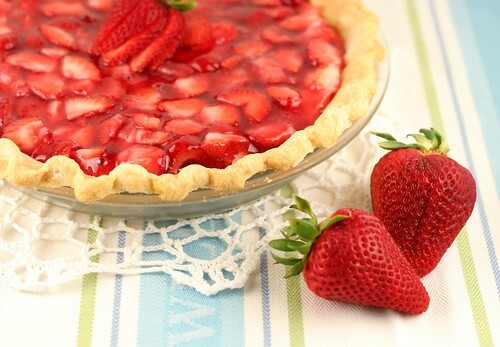 The filling for this pie consists of fresh strawberries in a sugary sweet glaze. The glaze is very easy... made with jell-o powder, cornstarch, water and sugar. That's it! It's basically a strawberry simple syrup. 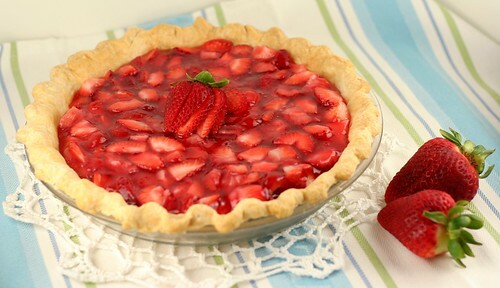 Once the glaze is completely cooled, mix in the diced strawberries and pour it into your pie crust of choice. Then take lots of pictures... because it's just too beautiful not to have it's moment in the spotlight. This pie is very sweet. I think it would be best topped off with fresh whipped cream that hardly has any sugar added. The tangy cream will off-set the sweetness of this pie perfectly. Combine jell-o powder, cornstarch, water and sugar in a medium-sized saucepan. Bring to boil, then let it boil for 1 minute. 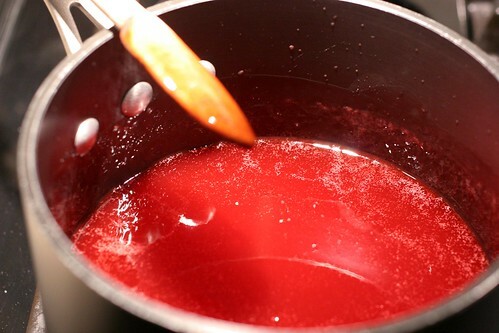 The glaze should be thick and the sugar dissolved. Remove from heat and let cool until cold. You may cover this and put it in the fridge for later use. 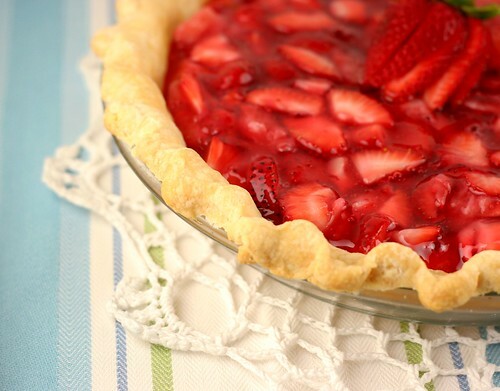 When ready to assemble the pie, add berries to jell-o mixture and stir. 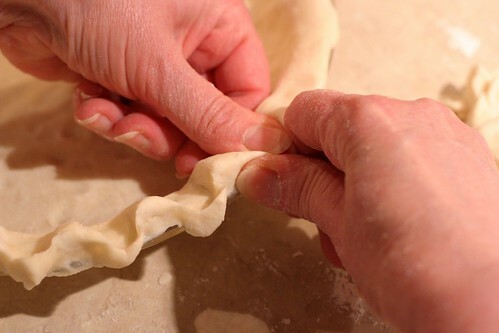 Then pour into cooled pie crust. Serve with fresh whipped cream! oh yum! i definitely need to try this i love like L O V EEEE strawberries! You're right that pie is a supermodel. I would still be taking pictures of it if it were at my place - just because it's so pretty from every angle. It sounds delicious, too. You make me laugh. And I love you. Ah! This pie is super gorgeous! I honestly don't think I've ever seen photos so vibrant!